By the turn of the 1990s, Western democracy appeared destined to become the universal governmental norm. However, as we move into the new millennium there are growing signs that extremism is far from dead. In recent years, the extreme right has gathered notable support in many Western countries, such as Austria, France and Italy. Racist violence, initially aimed at 'immigrants', is on the rise, and in the US, and increasingly in Europe, the state itself has become a major target. 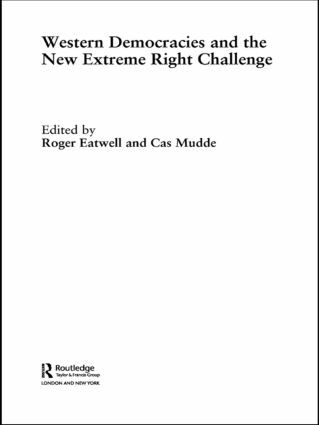 This book considers the varying trajectories of the 'extreme right' and 'populist' parties and focuses on the problems of responses to these trends, an issue which has hitherto been neglected in academic literature. Roger Eatwell is Professor of European Politics at the University of Bath, and specialises in fascism and the contemporary extreme right. Cas Mudde is Associate Professor in the School of Public and International Affairs at the University of Georgia, USA, and Researcher in the Center for Research on Extremism (C-REX) at the University of Oslo, Norway. This series covers academic studies within the broad fields of ‘extremism’ and ‘democracy’, with volumes focusing on adjacent concepts such as populism, radicalism, and ideological/religious fundamentalism. These topics have been considered largely in isolation by scholars interested in the study of political parties, elections, social movements,　activism, and radicalisation in democratic settings. A key focus of the series, therefore, is the (inter-)relation between extremism, radicalism, populism, fundamentalism, and democracy. Since its establishment in 1999, the series has encompassed both influential contributions to the discipline and informative accounts for public debate. Works will　seek to problematise the role of extremism, broadly defined, within an ever-globalising world, and/or the way social and political actors can respond to these challenges without undermining democratic credentials.